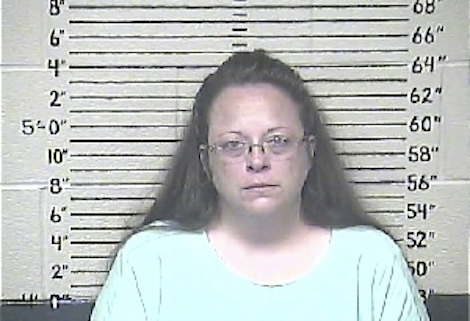 As you have probably heard, U.S. District Court Judge David Bunning ordered Rowan County (KY) Clerk Kim Davis released from jail on condition she does not interfere with her deputies’ processing of marriage licenses. But even as she was celebrating her freedom at a rally outside the jail, raising hands with Mike Huckabee (Ted Cruz, who had been hanging around Morehead, Kentucky, to take advantage of…er, support Davis’ cause, somehow missed the big moment), her lawyers were explaining she’d insist on going right back to jail if her name appeared on any of those marriage certificates. Now I don’t know how it works in Kentucky, but in most places the name of the magistrate responsible for marriage licenses has to appear on the license no matter who actually signs it, as a matter of statutory law. If that’s the situation, we’re back to the scenario where Gov. Steve Beshear would have to call a special session of the legislature to let Davis have her away. In any event, Davis’ self-positioning reminds me of the old southern tradition of “rejuvenating” virginity to which people are magically returned when it’s time for nuptials after a wayward youth. Davis seems to be a rejuvenating martyr, ready to climb back on the cross repeatedly. Kentucky authorities who are not covertly in her camp would be wise to deny her that opportunity if possible.